The odds of a messy trade war between the United States and China are rising again. The Trump administration shocked the world on Tuesday by tearing up a truce with Beijing and announcing it would impose tariffs on $50 billion worth of Chinese goods and restrict Chinese investment in the United States. China said Wednesday it was ready to retaliate. Here's a timeline that shows how trade tensions between the world's two biggest economies have grown for over a year. President Donald Trump, who repeatedly vowed to bring manufacturing and jobs back to the United States, directs the Commerce Department to investigate whether imports of foreign steel and aluminum from China and other countries could be a threat to national security. Trump launches a new investigation explicitly targeting China. He asks US Trade Representative Robert Lighthizer to look into unfair Chinese trade practices, with a particular focus on alleged theft of US intellectual property. China's state-run media says the probe will "poison" the relationship between the two countries, while the Chinese government later slams the Trump administration's "unilateralism and protectionism." The Trump administration's threats against China, including the investigations, don't result in tangible action over the rest of 2017 as Trump shows restraint amid a budding relationship with his Chinese counterpart Xi Jinping. However, experts warn that 2018 could be a different story. The first major trade action against China comes at the beginning of the year, when the United States announces tariffs on imported solar panels, most of which come from China, and washing machines. China expresses "strong dissatisfaction" over the decision, adding that it "aggravates the global trade environment." Trump follows through on tariff recommendations from his commerce department, announcing a global tax on steel imports at 25% and aluminum imports at 10%. China, the world's biggest steel exporter, calls the tariffs "a serious attack" on international trade and says it will take "firm action" if Chinese businesses suffer losses as a result. Beijing imposes tariffs on about $3 billion worth of US imports, including a 15% duty on 120 American products such as fruits, nuts, wine and steel pipes. There's also a 25% tax on eight other US goods including recycled aluminum and pork. The Chinese government says its tariffs are specifically in response to the US trade measures against steel and aluminum. Trump's team responds barely 24 hours after China's first retaliation. The US Trade Representative proposes a 25% tax on close to 1,300 Chinese goods from the aerospace, machinery and medical industries. The goods account for about $50 billion worth of Chinese exports. The next day, the Chinese government announces plans for another set of retaliatory tariffs that nearly mirror the Trump administration's proposal -- 25% on a range of US products worth approximately $50 billion. The 106 products on China's list include aircraft and automobiles as well as soybeans and chemicals. Trump threatens a wave of new tariffs worth $100 billion. He asks Lighthizer to look into which products his administration can target. China warns it has "already formulated very detailed countermeasures." The United States turns up the heat again, banning one of China's biggest tech companies -- ZTE (ZTCOF) -- from buying components from American firms for seven years because it allegedly failed to honor a deal under which it admitted to violating sanctions on Iran and North Korea. The next day, China's Commerce Ministry said it would start charging importers a fee of about 179% on US sorghum after an investigation found the shipments were unfairly subsidized and damaging Chinese producers. Sorghum is a grain that is used to feed livestock and make a popular Chinese liquor. American imports of sorghum to China were worth nearly $1 billion last year. Officials from the United States and China say they would be interested in holding talks to discuss trade issues. The White House describes the first round of talks in early May as "frank discussions." China says the two sides were far apart on some issues. As talks continue, Trump tweets that he is working to give ZTE "a way to get back into business, fast." Commerce Secretary Wilbur Ross says the administration is exploring "additional remedies" to its harsh punishment of the Chinese smartphone maker. 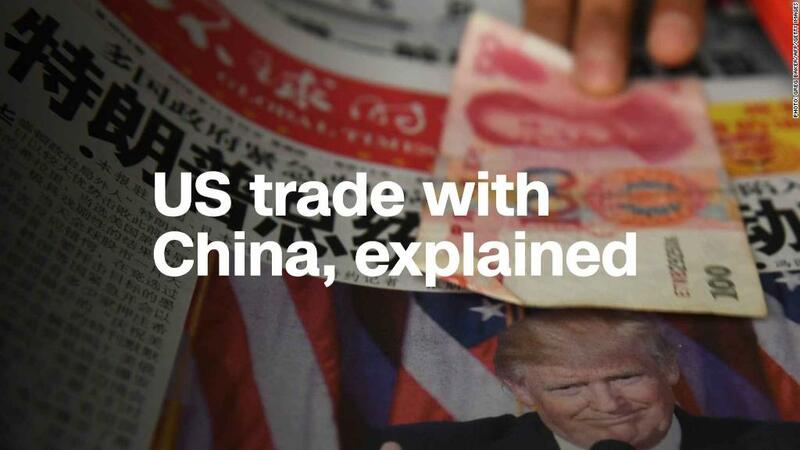 US officials tell CNN that Beijing has proposed boosting Chinese purchases of American goods by around $200 billion to reduce the massive trade imbalance between the two countries. But China's Foreign Ministry quickly denies the assertion, saying "these rumors are not true." However, China announces it will remove its huge import tax on US sorghum in a move to ease tensions. China and the United States announce they have reached a ceasefire, leading to a brief period of calm. In a joint statement, the countries say China will "significantly increase" purchases of US goods and services, but they do not put a dollar amount on China's commitment. Both sides agree to not impose new tariffs on one another while talks continue. "We're putting the trade war on hold," US Treasury Secretary Steven Mnuchin tells Fox News. A few days later, China's Finance Ministry says it plans to cut import duties on passenger vehicles from 25% to 15%. Trump had previously criticized these duties, saying they were unfair and significantly higher than US duties. In a surprise move, the White House says it will move ahead with its 25% tariffs on $50 billion worth of Chinese goods. It also announces new limits on Chinese investment in high-tech industries. China says it is ready to retaliate. "We want to reiterate that we don't want a trade war, but we aren't afraid of fighting one," says a spokesperson at China's foreign ministry. — Jackie Wattles contributed to this report.